I find myself saying that “this recipe” is one of my favorite recipes a lot, and I was thinking tonight that my list of favorites is getting quite long haha, so not sure if that makes them unique anymore or not! But y’all… THIS. 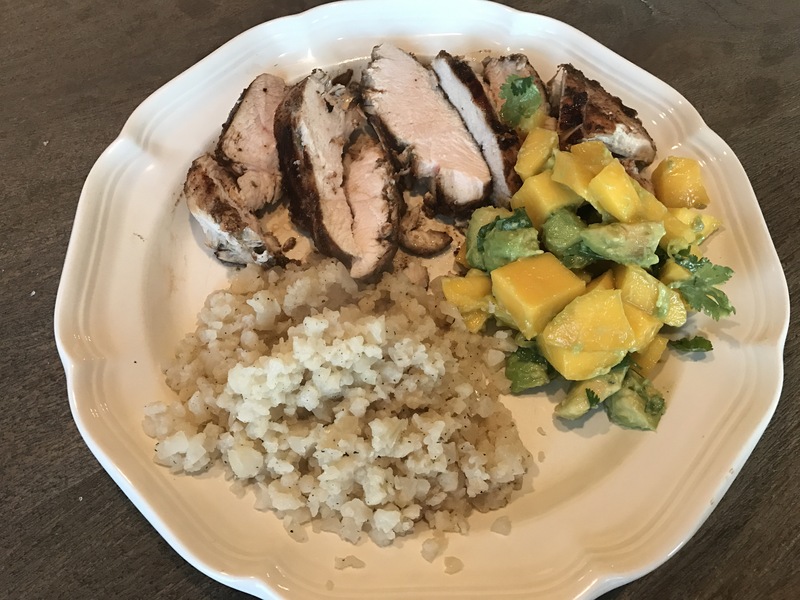 THIIIIIIIISSSSS….. Jamaican Jerk Chicken, with Mango Avocado Salsa on a bed of Cauliflower rice… I’ve been dying over this for a little while now. I’ve made it a couple of times now and it does not disappoint. I crave this puppy. It’s the perfect balance between spicy and sweet, a tangy delicious meal with a million different flavors that kind of burst together to make this meal an experience. Sound overboard? It’s not. You need this in your life. I won’t keep you waiting any longer. Here are the deets. Bookmark this baby because you need to come back to it again and again. Trust me on that. It just is a meal that makes you happy and one that you eat so fast you kind of can’t believe it’s over. So you just eat it leftover the next day. Because they are good. And the avocado in the mango salsa stays decent because of the lime juice in it, so no worries there! I tenderize my chicken with a meat pounder, but you don’t have to do that. Coat the chicken with the marinade and store it in a large ziplock bag in your refrigerator. She says for a minimum of 20 minutes, preferably for two hours. 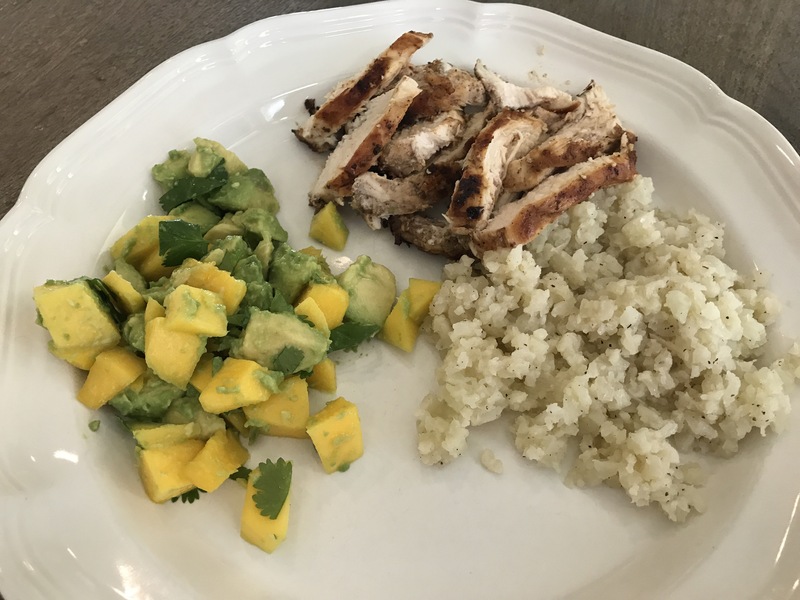 When you are ready to cook the chicken, heat a couple of tablespoons of coconut oil in a skillet and then place the chicken breasts in the skillet. You could also grill these if you wanted! I also make a few shallow slices with my knife in my chicken breasts if they are really thick, just so they will cook a little more evenly and cook all the way through. Heat the chicken on both sides, checking to see that it cooked all the way through. Let it rest on your cutting board for a minute before slicing it into strips. 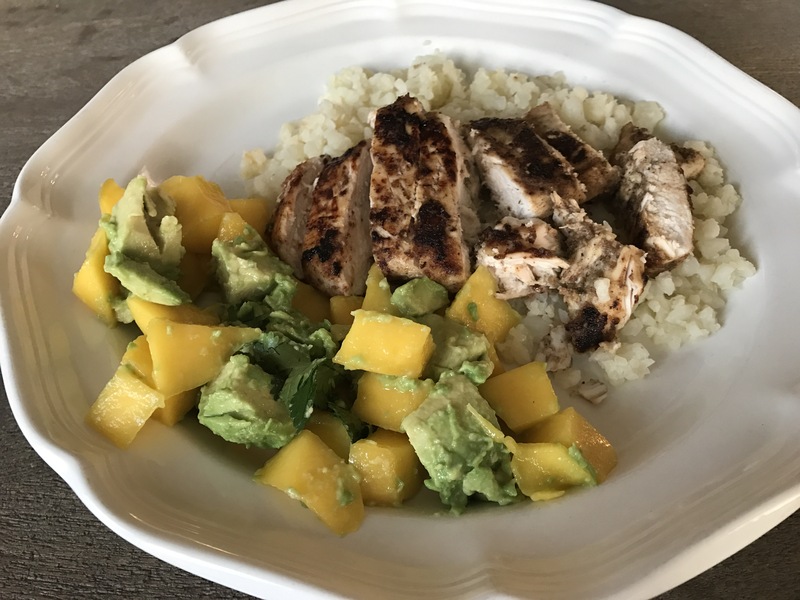 While your chicken is cooking, combine the ingredients for the mango salsa in a bowl. 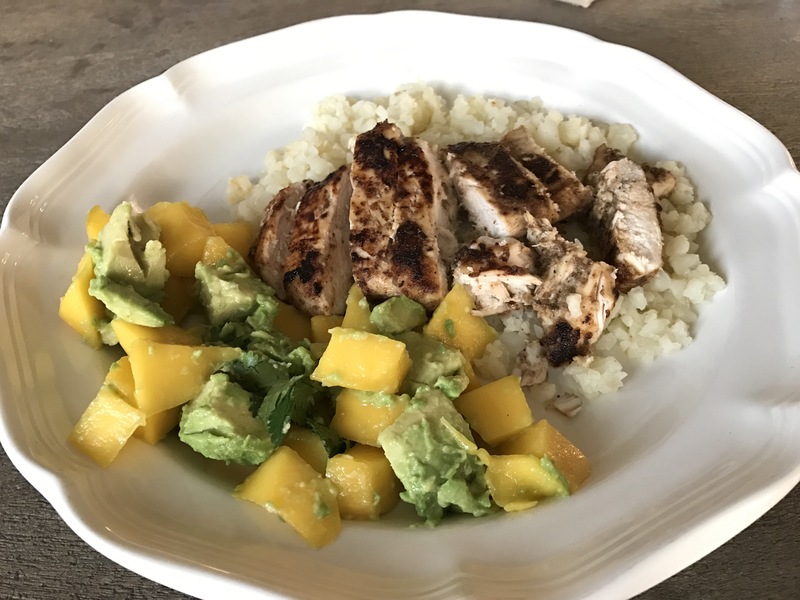 Serve the chicken with cauliflower rice (or regular rice if you prefer) and top with the mango salsa. Then let your tastebuds have a little party in your mouth! Hope you enjoy!